Princeville's Pu'u Po'a Paradise - Ocean Front Beauty! 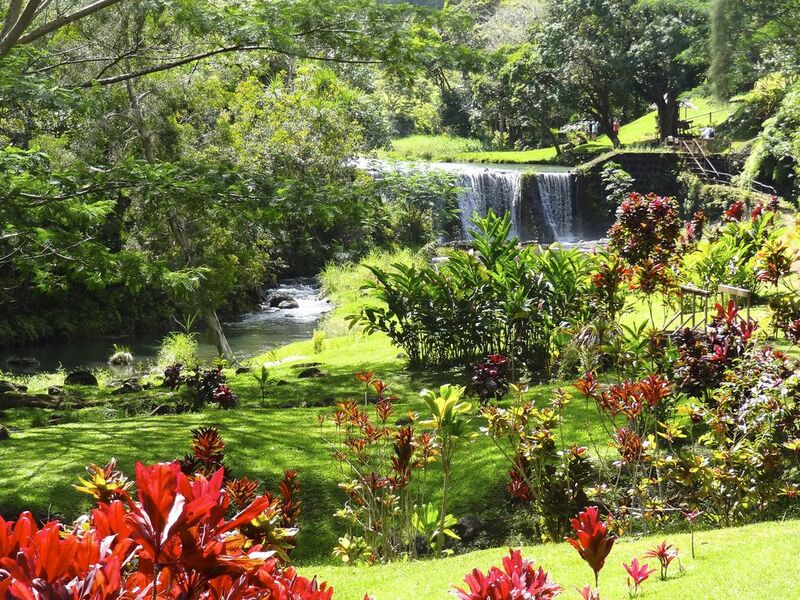 Travelers from all over the world have come to discover the rare beauty and peaceful sanctuary that is Princeville -- on the North Shore of the Garden Island of Kauai. Pu'u Po'a #204 is perfectly situated on an ocean bluff next to the five-star Princeville Hotel, in the Hanalei District of the North Shore of Kauai. The prestigious Pu'u Po'a condominium is blessed with an incredible vista of the Pacific Ocean from sunrise at Hideaway Beach, to sunset over Bali Hai on Hanalei Bay. Our 2,000 square-foot condo offers full ocean views from the living room, dining room, kitchen, master bedroom, sun room, and large open-air lanai. There is an on-site private tennis court, and a heated swimming pool that is beautifully perched on the bluff overlooking the Pacific Ocean! This contemporary 54-unit condominium community is surrounded by beautiful Hawaiian landscaping to complement the unparalleled views from the site. You will thoroughly enjoy watching whales, dolphins, sailboats, and surfers from the comfort of your vacation home. Relax with all the amenities needed to make your stay very comfortable and enjoyable. Pu'u Po'a #204 features spacious and well furnished living accommodations. Soak in the Japanese O'Furo hot tub. Enjoy breakfast on the lanai overlooking Hideaway Beach. Prepare more formal meals from the full kitchen, and serve them in the dining room with a table and seating for six. There are new appliances and furniture throughout, as well a large-screen TV, cable, a stereo, High speed Broadband Internet access, and much, much more. There is an unlimited amount of activities available here on the North Shore of Kauai. Besides the 45 holes of world-class golfing within minutes of the condo, there are miles of walking and biking paths, as well as beach access to the exquisite Hideaway Beach -- just beneath our condo. There is also easy access to Pu'u Po'a Beach on Hanalei Bay, in front of the Princeville Hotel. Horseback riding is available nearby at the Princeville Ranch; polo matches are held in season at Anini Beach. People come from all around the world to hike the Na Pali Coast, as well as many other fantastic trails on Kauai. Kayaking the seven rivers of Kauai is a treat only surpassed by taking a kayak out of Hanalei Bay to paddle with the dolphins and Honu - Hawaiian sea turtles. Ocean sports are unparalleled here in Kauai. Many people enjoy surfing, windsurfing, snorkeling, diving, sailing, and fishing, as well as swimming and beachcombing on the many beautiful beaches on the North Shore of Kauai. So make your vacation dreams come true. Viewing the majestic 4,000 foot-high Waialale Mountains with rainbows and waterfalls on the entry side of Pu'u Po'a -- and the awe-inspiring and ever-changing Pacific Ocean on the front, you'll see why so many people agree that Princeville is 'A Little Bit of Heaven That Fell to Earth'. Originally from Pennsylvania, I spent most of my life traveling on ships, and ashore all around the world. I chose Hawaii as the best place to live because of its spectacular beauty, and it still offers all of the luxuries and conveniences that can only be found in America. After 15 years of living;, loving and exploring the Hawaiian Islands, my wife and I decided that the North Shore of Kauai, and in particular, Puu Poa condos in the Princeville Resort, is the most beautiful location in all the islands. It also offers everything that anyone could ask for to live life to its fullest. Because Puu Poa 204 is our home when we are not traveling, it offers many amenities that you will not find in a typical vacation rental. We are sure that you will find as much joy and fun as we have in this incredibly special part of the world! Both bathrooms are beautifully decorated with marble tiling and koa and cherry wood cabinets. The master bathroom has a large walk in shower and a Japanese style hot soaking tub. Hanalei Village offers many great restaurants, bars with live music, art galleries and shops in a beatiful setting next to mountains and seashore. Puu Poa is perched on an Ocean Front Bluff right above pristine Hideaways Beach. It is a wonderful, secluded spot to relax beneath the Kamani tress, snorkle and surf. Nearby Hanalei River is a beautiful waterway that drops via Waterfalls to the sea. It is a great spot for kayaking and stand up surfing, all the way out to the amazing coral reefs of Hanalei Bay. View the 5000 ft. Waialale Mountains with waterfalls galore! Fnatastic Ocean views from every room in the Condo! Puu Poa is right above pristine Hideways Beach. Free calls to U.S. from the home phone. Gourmet Kitchen with Granite Counter Tops and full utensils. Hi-Def 55 inch LCD TV with Hi-Def channels. Bose Wi-Fi Stereo Speaker. You can play music from your own smart phone..
Hawaiian Music and IPod dock provided. Tennis court on property (right out the door). Tennis rackets provided. 54 of Kauai's Best Gold Courses nearby in the Princeville Resort. We also have golf clubs for your use. There are about 6 steps up and 6 steps down to enter condo. We had a wonderful stay in Kevin's condo. It's a great location in Princeville: right above a good snorkeling beach, close to Princeville center, walking distance to the Princeville resort. The condo is beautifully laid out. Loved having the windows open all night for the ocean breeze and sound of the waves. Kevin was very responsive when we needed something (or had trouble finding something). The only thing I wish were different were the quality of the dishwasher and some of the pans/knives. Nothing but good things to say about this place. Kevin was responsive and easy to work with. Truly beautiful views out the front and the back. The condo feels more like a home than a rental, with beautiful furnishings and art, and a fully stocked kitchen. We really appreciated our week in this lovely home. The view was amazing, the amenities were above average and the atmosphere was very relaxing. Would definitely book a repeat vacation there. Exactly as advertised, spacious rooms with wonderful views, fully equipped kitchen. Has all the amenities that a person would want, including a grill on the lanei, which due to the weather we were only able to use once. Walking distance to Princeville Resort where we had a wonderful anniversary dinner with friends who were also thoroughly impressed with the property. All of us have already made plans to return to this paradise on Kauai. Only drawback, which has nothing to do with the property, is the traffic driving from Princeville to the southside of the island, but it is what it is. Had a great time and will be back. The condo was as advertised. Very nice furniture and art. The view was the high point. Would definitely stay here again. We had such a great time! The property and condo were perfect. Condo was very clean and was stocked with everything you could possibly need and more! Everything for the beach, kitchen, and even ink for the printer which was a godsend for us as we had some last minute documents that had to be signed. Location was amazing, my husband surfs so he had a ton of places to choose from. Kevin was great and very responsive. Puu Poa Condos are the most prestigious private accommodations within the fabulous Princeville Resort and are adjacent to the 5 Star Princeville Hotel. The North Shore of Kauai is a tropical paradise with many of the most beautiful beaches in Hawaii, dramatic, lush green mountains with cascading waterfalls and rainbows, the best golf courses in the state, and a multitude of top notch restaurants, music and entertainment opportunities and unlimited ocean and beach activities. Golf: Our Puu Poa condo is surrounding by 54 of the finest holes in Hawaii Golf. The 18 hole Prince Course is the number one rated course in Hawaii and the 27 hole Makai course features the Ocean, Lakes and Woods 9's that offer challenging and beautiful resort golf. The island of Kauai also boast the Poipu Golf Club which is the home of the PGA Grand Slam, the Kiele Course and Waiua public courses and many other great courses.